If you don’t recognize the hashtag above or if you have not clicked on it in your Twitter stream this week, then you are in for a wonderful surprise right now. #Sciart stands for science art. It’s a twitter hashtag used identify any art or artist that has a relationship with science. It includes medical and scientific illustrators, sculptors, 3-D modelers, jewelry makers, clothing and fabric designers, tattoo artists, cartoonists, photographers, painters, video producers, and many many other artistic people. 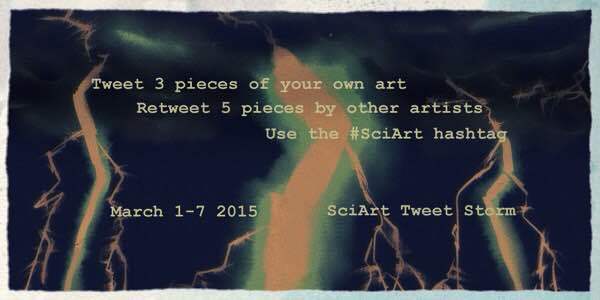 The goal was modest — 1,600 tweets containing #SciArt per day; 11,200 in a week. The result was glorious. Not only did #sciart surpass the Tweet goal (> 5,000 tweets in first 2 days; 12,000 as of Thursday morning) but the stunning beauty and expansive variety of the art has been simply overwhelming. In a world grown weary of online complaints, harassment and criticism, the #SciArt gallery has captivated Twitter. Ok, I’m really going to try to stop now. You’ll have to go see the rest yourself. Enjoy! NextNevermind Basketball. It’s time for Mammal March Madness #2015MMM!